They came, they battered, they bickered. 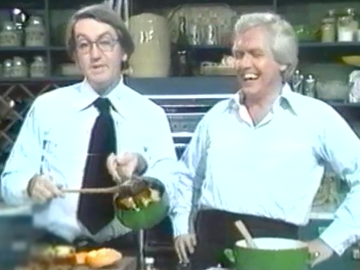 Peter Hudson and David Halls were as famous for their on-screen spats as their recipes. The couple ("are we gay? Well we're certainly merry") turned cooking into comedy, and won Entertainer of the Year at the 1981 Feltex Awards. This 73-minute documentary explores their enduring relationship and tragic passing — from memorable early days entertaining dinner guests at home and running a shoe store, through to television fame in NZ and the UK. The interviews include close friends and many of those who worked with them in television.